Derry's hopes of achieving three league wins in a row were dashed as they fell to Premier Division leaders Dundalk after having Conor McCormack sent-off. Recent signing McCormack was dismissed in the 24th minute for his challenge on Sean Gannon. Dundalk broke the deadlock in first-half stoppage-time when Ciaran Kilduff scored from in front of goal. David McMillan shot in a late second goal to confirm Dundalk's third league win over Derry this season. With second-placed Cork City losing at home to Limerick, Stephen Kenny's Dundalk now find themselves seven points clear at the top of the table. The big talking point in Friday's clash at the Brandywell was the straight red card issued to midfielder McCormack. 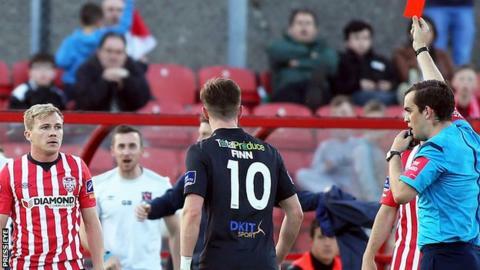 Derry were left reeling by what they felt was a harsh decision by referee Robert Harvey. Candystripes assistant manager Paul Hegarty was ordered from the dug-out by the ref - apparently for taking the protests too far. The hosts were coping quite well with 10 men and Mark Timlin went close with a fine left-foot effort. But Dundalk struck in the third of the four minutes of additional time at the end of the first half. The home defence appeared to switch off and, when Dane Massey rolled the ball into the danger area, former St Pat's Athletic striker Kilduff pounced in front of goal. Dundalk had chances to extend their lead in the second half and they eventually got it when substitute McMullan shot in to punish hesitancy by Derry replacement Seamus Sharkey. The red-carded McCormack will be suspended for Derry's game away to Sligo in the Premier Division on Monday night.